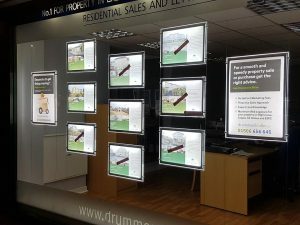 Our customer asked us to improve and update their window displays for property and advertising. 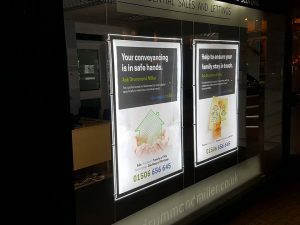 Due to the busy location, A0 sized LED illuminated posters were preferred by the customer to make use of the excellent advertising space available with the large office windows. 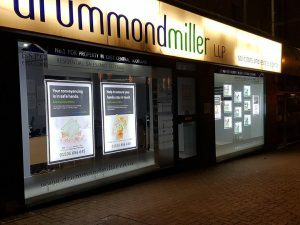 The other window was used to display illuminated property cards, using our A2 and A3 sized LED light panels. The staggered look works well with a minimalist approach, giving each individual pocket surrounding space to get the best effects of the lighting, with the layout giving it an all over, modern and attractive look. 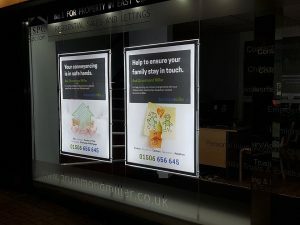 Our high quality light pockets are edge lit, but also supply an even spread of light to fully illuminate your property cards and/ or posters. 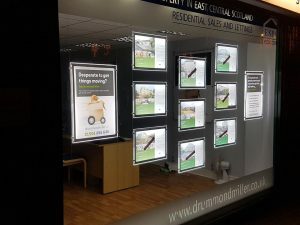 The light pockets require very little maintenance and you should expect to get up to 10 years lifetime from them, making them an excellent investment to bring your business up to date with the modern high street. We’re delighted to have yet another happy customer. Contact our friendly staff now and we will be very happy to help you.